I wonder what they were looking at? 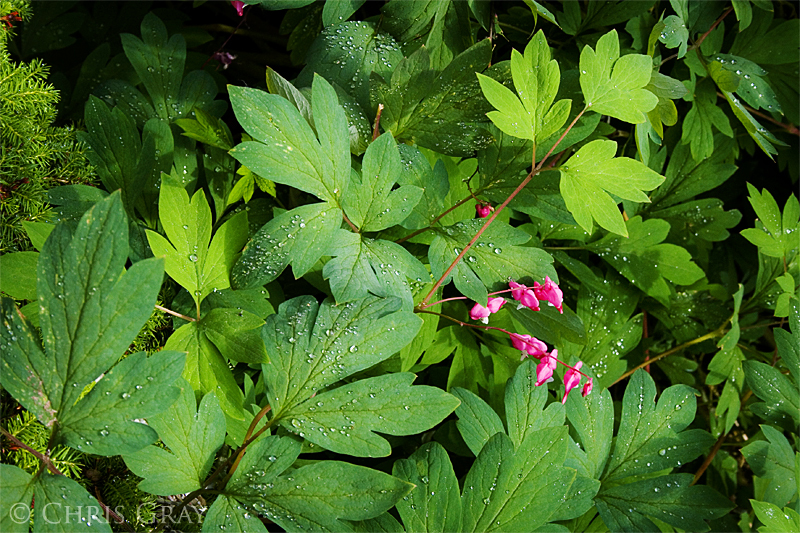 Everything is so fresh and clean after the rain. It's always nice to have friends with the same interests as you. There was actually a fourth girl, but she didn't fit into the frame for this shot. 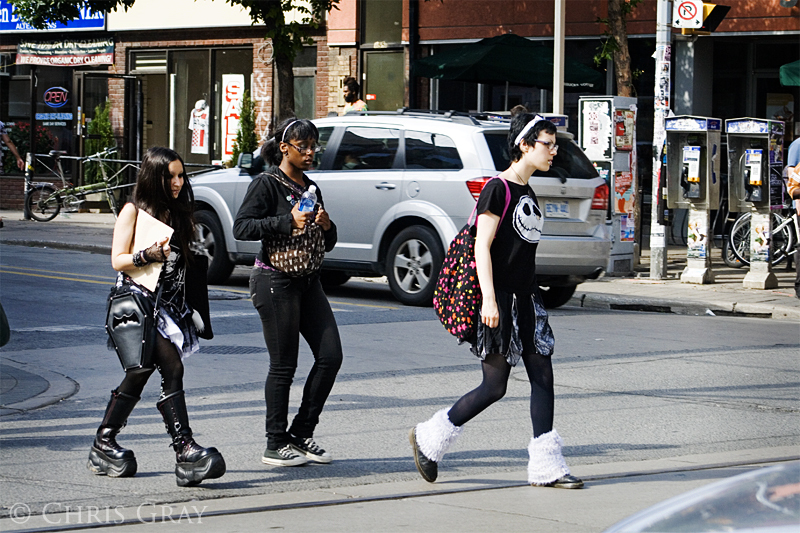 You never know what you'll see on Queen Street West, though - that's why I love shooting there. I spotted this guy while we were walking up from the waterfront. I normally don't like seeing bikes up on the sidewalk, but I kinda understand his reasoning in this case. Wonderful combination of colors just outside of the Black Bull pub on Queen Street. 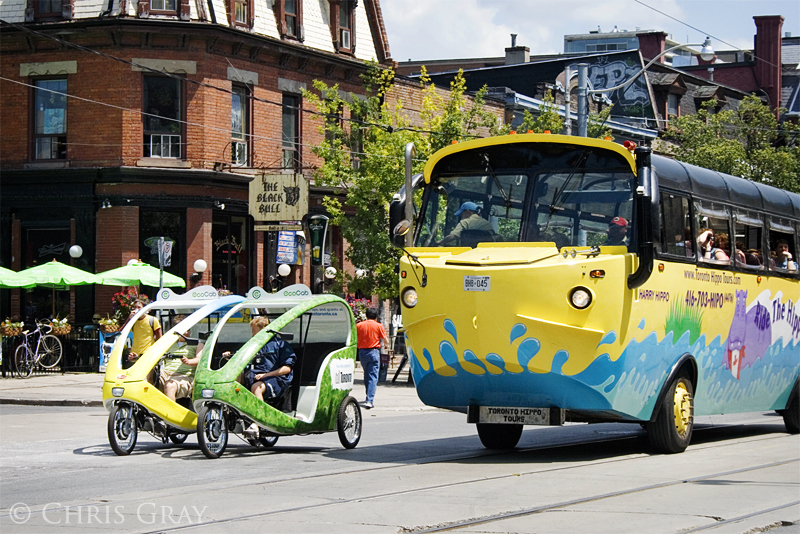 The Hippo Tourist Bus is a frequent sight downtown, and the EcoCabs are now more regularly seen. 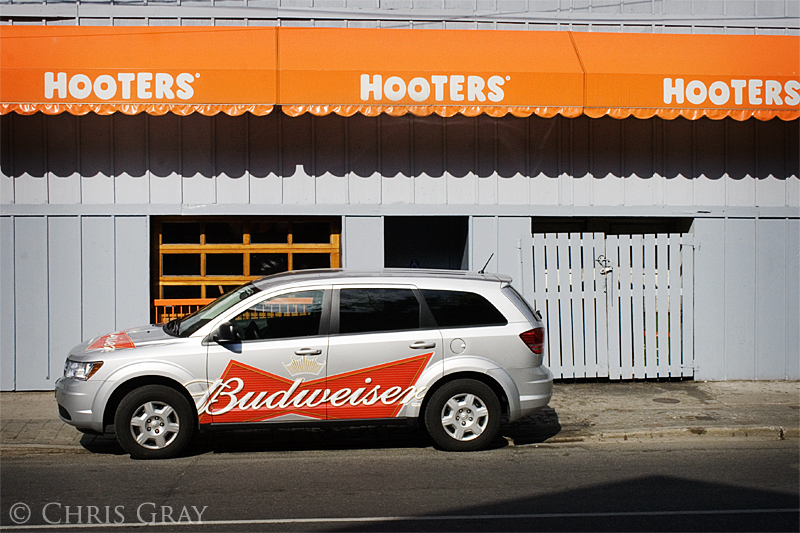 I caught a glimpse of a promotional shoot going on at the Hooters on John Street. She's standing in front of a big treetop, which should give them a nice green leafy background in their shot. 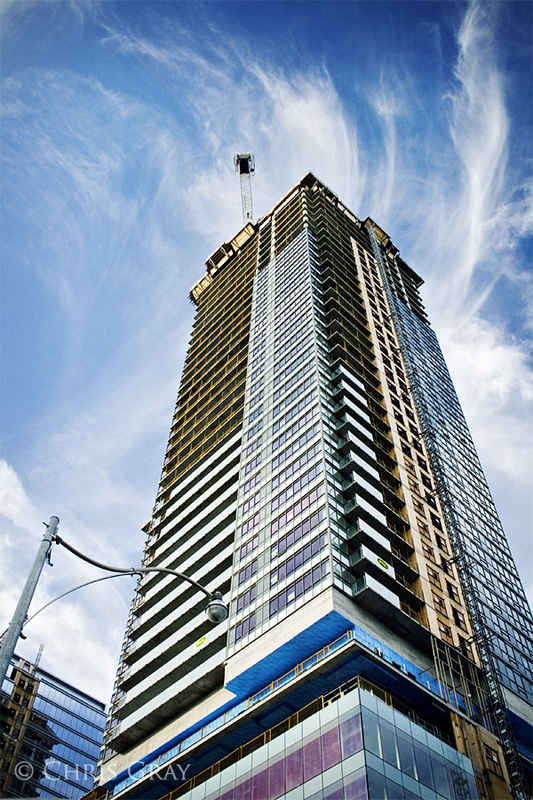 Walking along Queens Quay yesterday, I looked up at the construction, and spotted some wonderful cloud formations above this building. It was gorgeous down by the water, and a welcome antidote to the craziness of the day. They've started tearing down the stage on John Street south of Queen after the Much Music Video Awards. 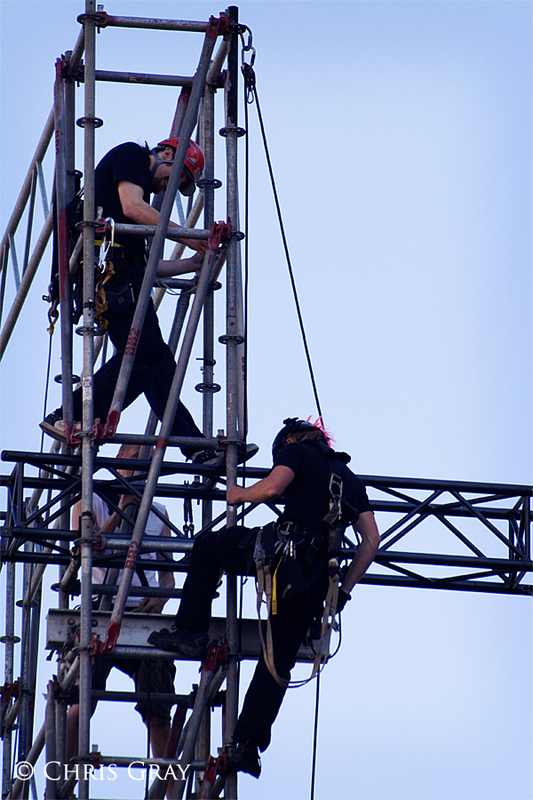 These guys are at the top of the structure, disassembling it piece by piece. 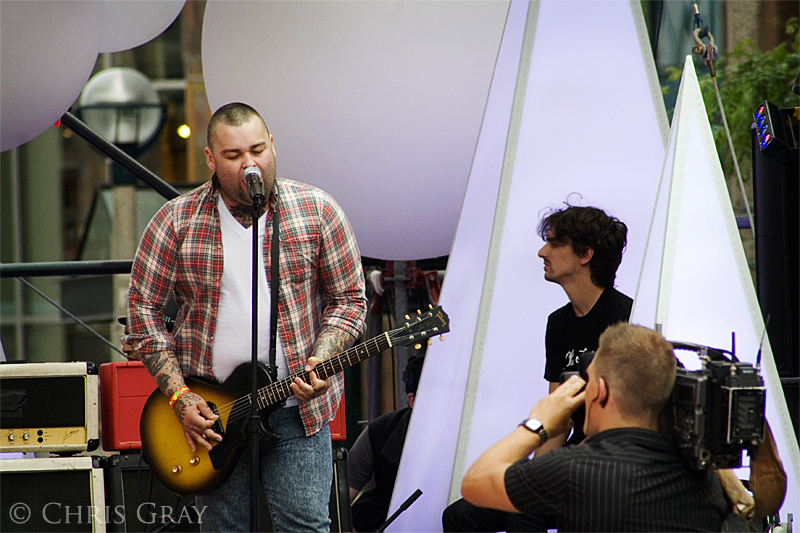 Alexisonfire practices on the John Street stage at the Much Music Video Awards. They were practicing on Friday as I came out of work, and it was pretty loud. 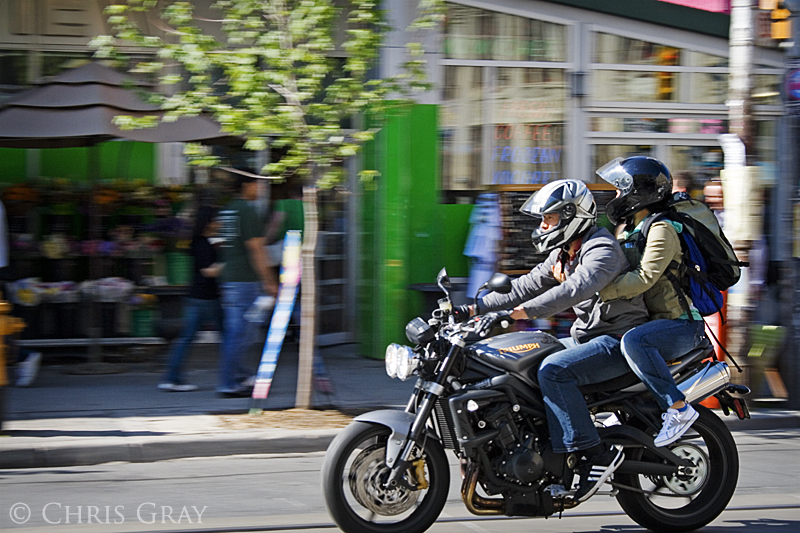 I took a series of shots from across the street with my 75-300mm zoom, and I got a couple of good ones. Event staff were busy setting up the stages at the Much Music Video Awards this week. 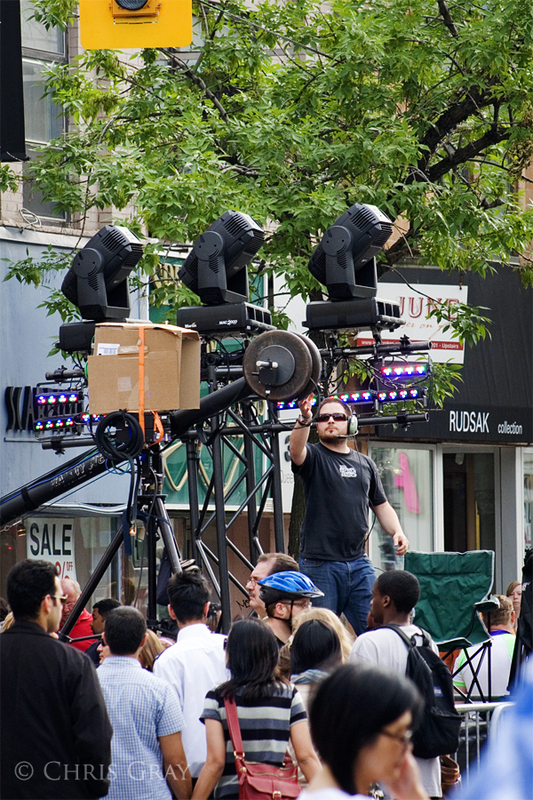 Here you can see part of the setup for the secondary stage on John Street. 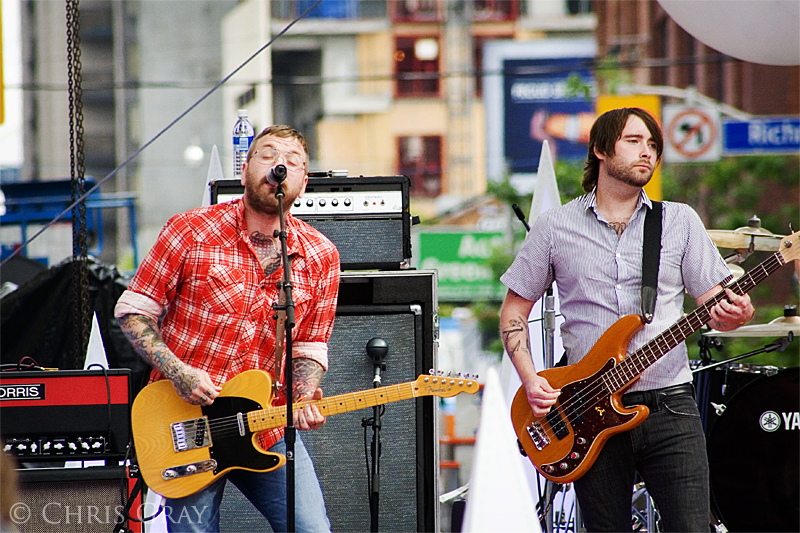 The street was blocked off from Queen down to Richmond for most of the week, as they set up the stage. Waiting for concrete to pour - you have to be patient. You can speed it up by adding water, but then the mix is too runny. If you don't have enough water, it won't pour, it'll roll out of the mixer. These guys seem to have it pretty much right. Proper stretching is tremendously important. With the sunshine we had the other day, lots of people were out in the park near my work. Some were playing frisbee, some were enjoying their lunch. This guy seemed to be doing yoga. I have to say that I love the summer, and I can't wait for more consistently warm weather to arrive. 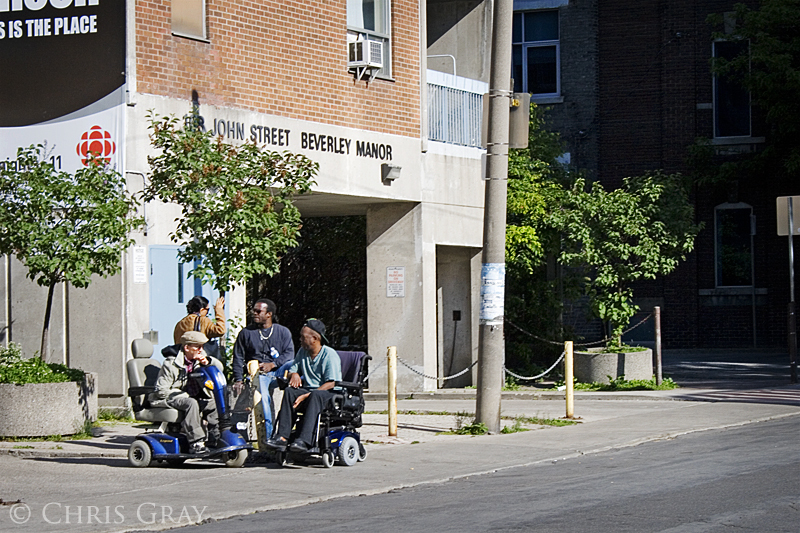 I spotted this interesting vehicle on Queen Street at Broadview. 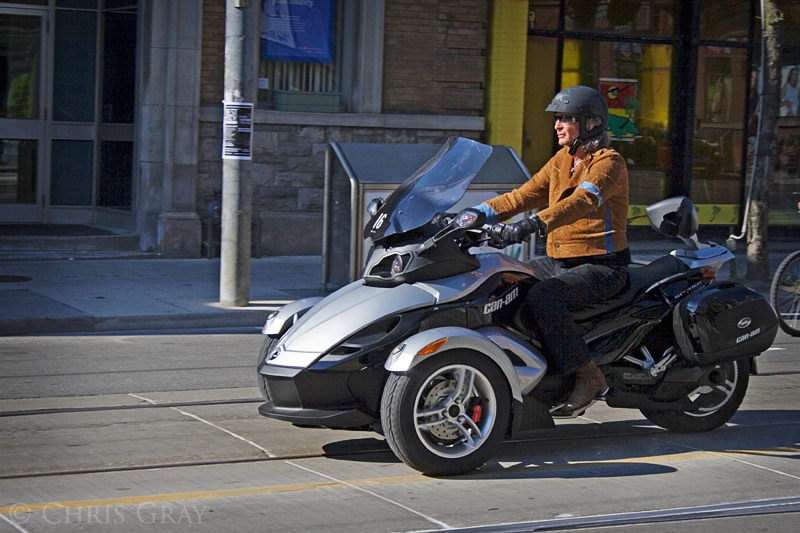 It certainly looks cool - sort of a cross between a motorcycle and a small car - but I wonder what it's like to drive. 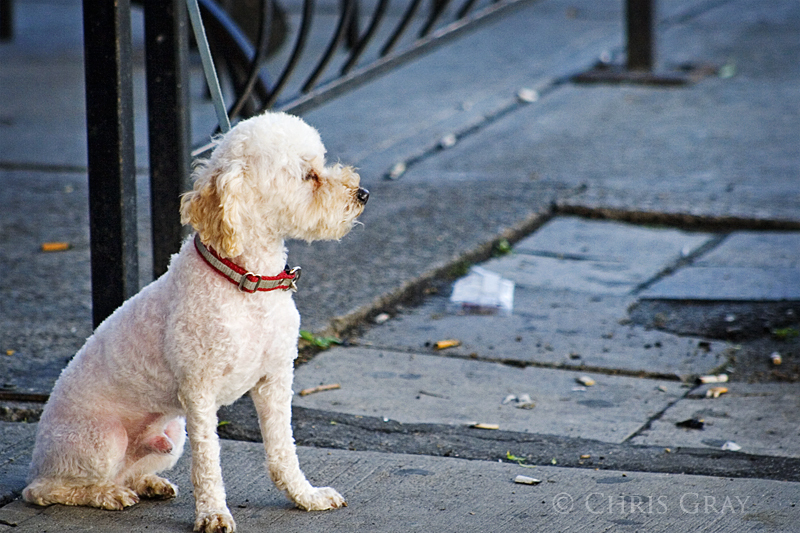 Waiting for the return of his master, I guess, outside of the Starbucks at Queen and John. Somehow, they seem to go together pretty well, don't you think? Taking a smoke break on Queen Street. 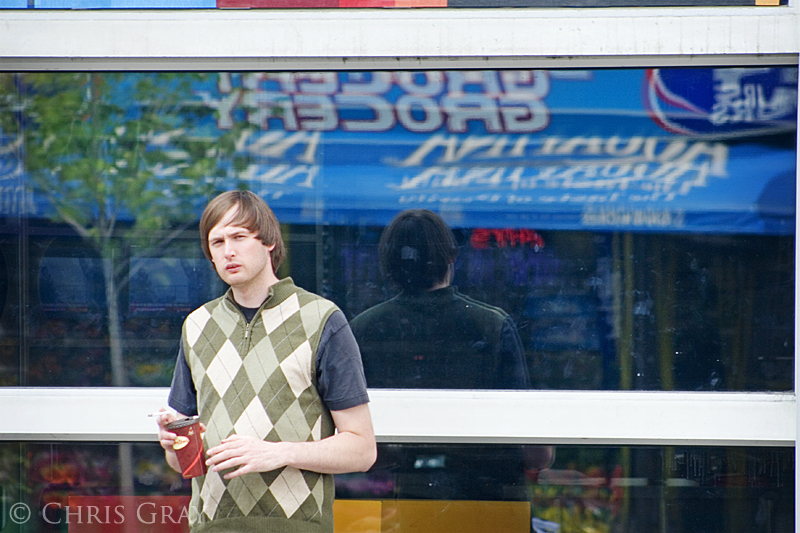 Accidental urban camouflage - I love it. 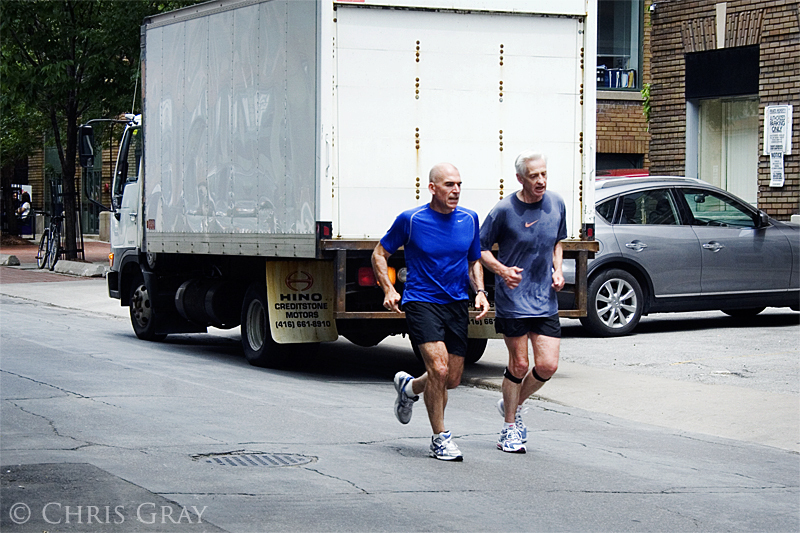 These two were having a conversation as they ran by me at lunchtime. I can't do that - when I run, I don't have enough breath to talk. Of course, if I ran more often, I would. 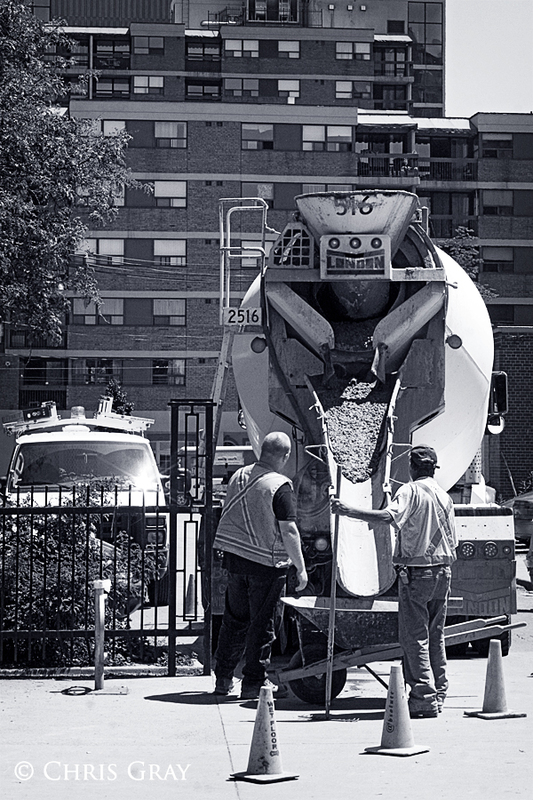 We live near the Metro Works department's offices on Eastern Avenue, so periodically, we see trucks filled with various pieces of heavy equipment parked on our street. 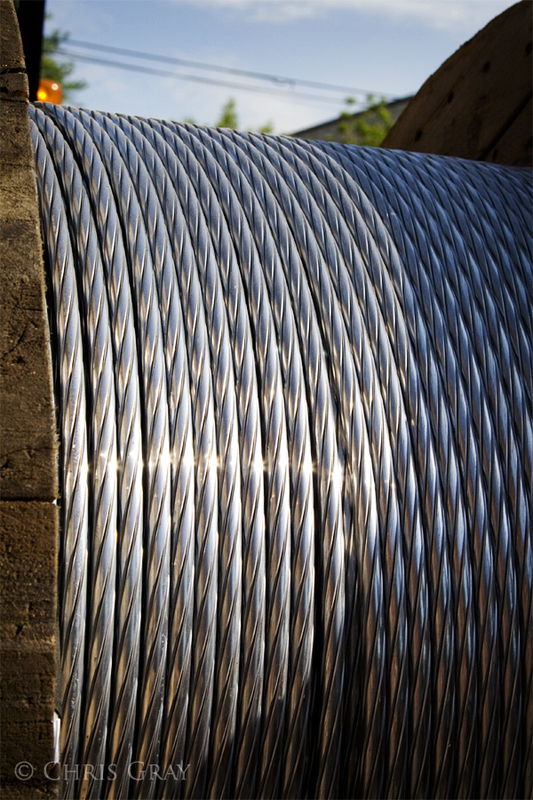 This time, it was steel cable on a large, wooden spool, shining in the sun. I like how she blends into her background. 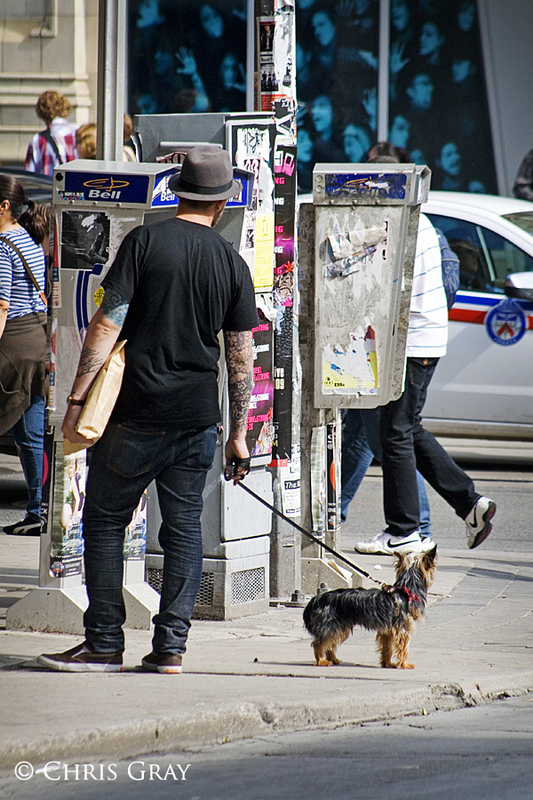 More urban camouflage - yay! 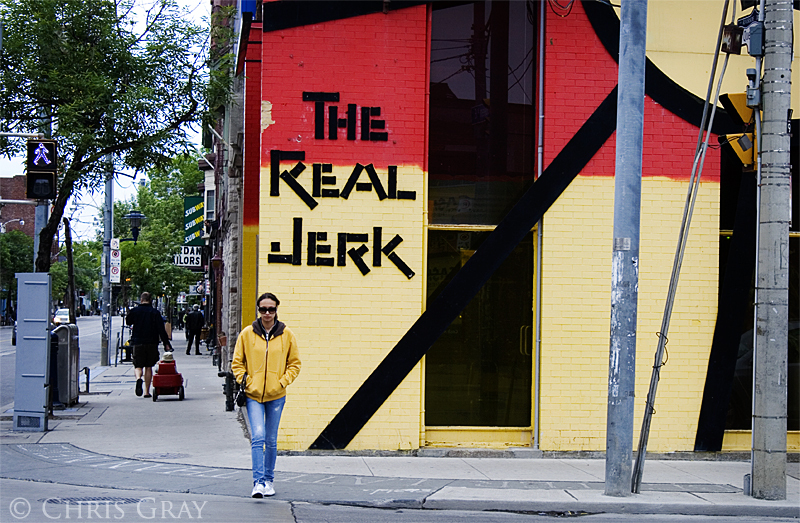 As a side note, I thoroughly recommend trying out the restaurant behind her - The Real Jerk. Excellent Caribbean food, great prices, and a really pleasant staff. 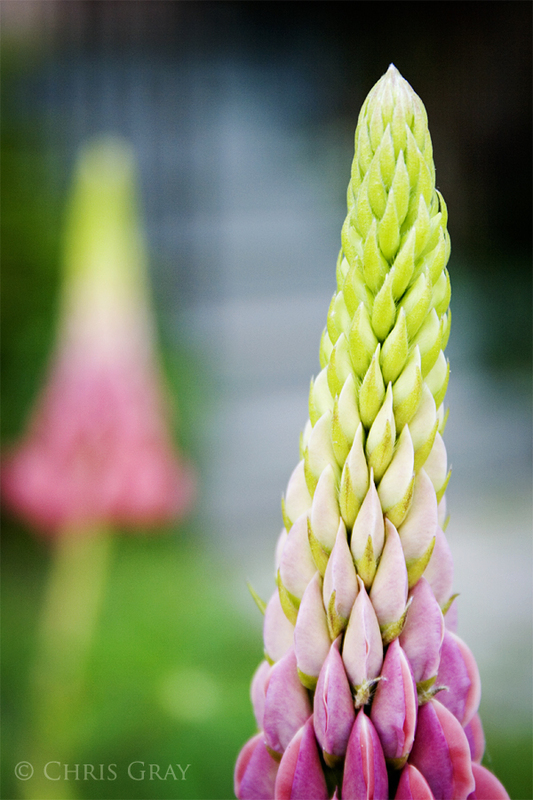 The lupins are blooming in our front yard. I wish there was some way to have them bloom more than once, but they're a June flower - they'll be fading by the middle of July, if I recall correctly. But they're cool, the way their flowers appear on the stem. 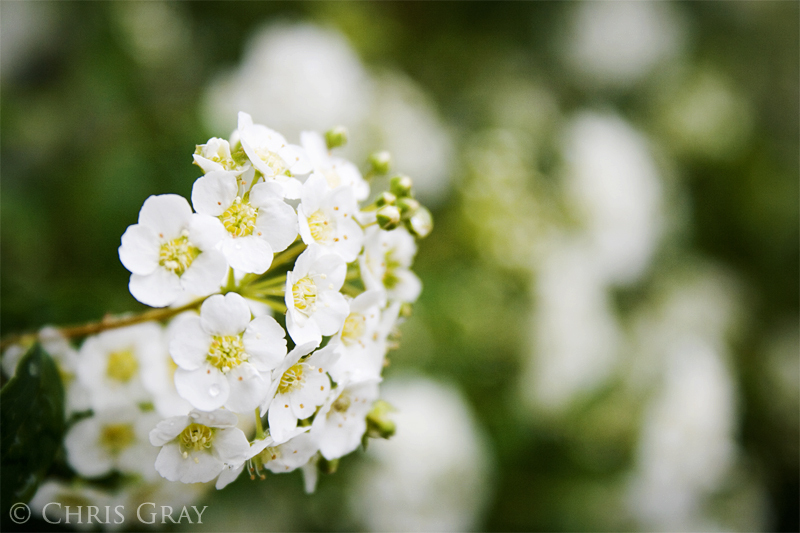 They start out like you see at the top, and then the colours appear, and the individual flowers bloom. 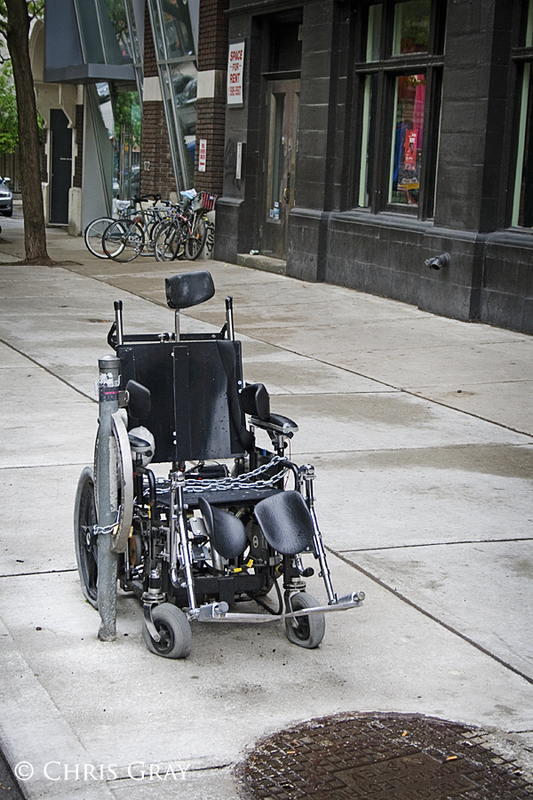 Getting around the city is much easier with smaller vehicles. 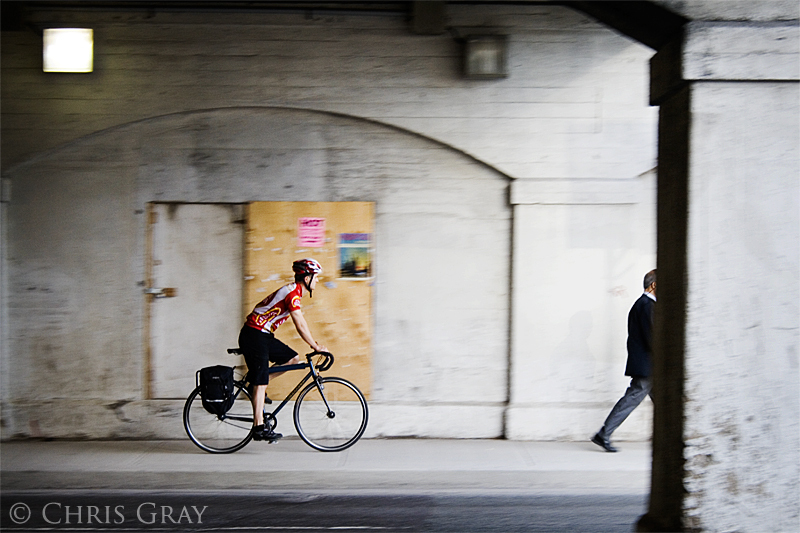 Every day, I see people using skateboards, roller blades, bicycles and bikes zipping around, while cars, SUVs and trucks keep getting blocked by traffic. Why, exactly, would you drive an H3 or a Land Cruiser through downtown Toronto traffic, in rush hour? Taking a break while she waits. It's gotta be boring, waiting for kids to come along to cross the street. 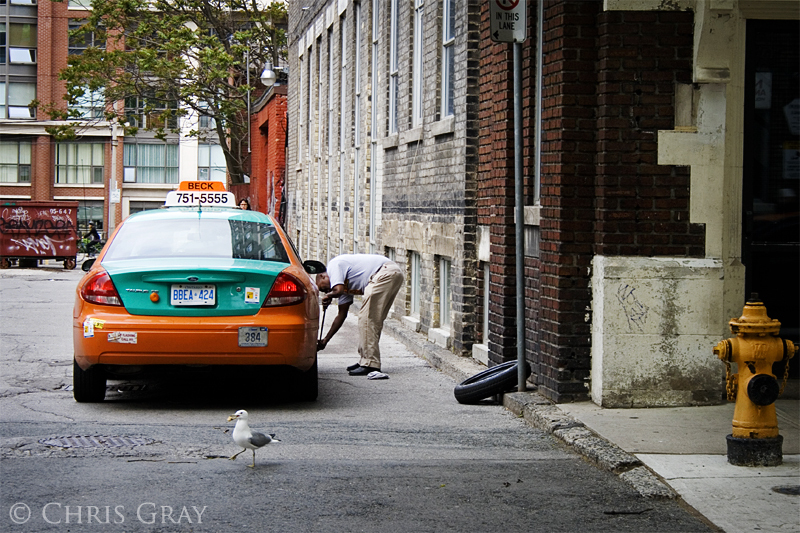 I betcha that the seagull is happier than the taxi driver right now. 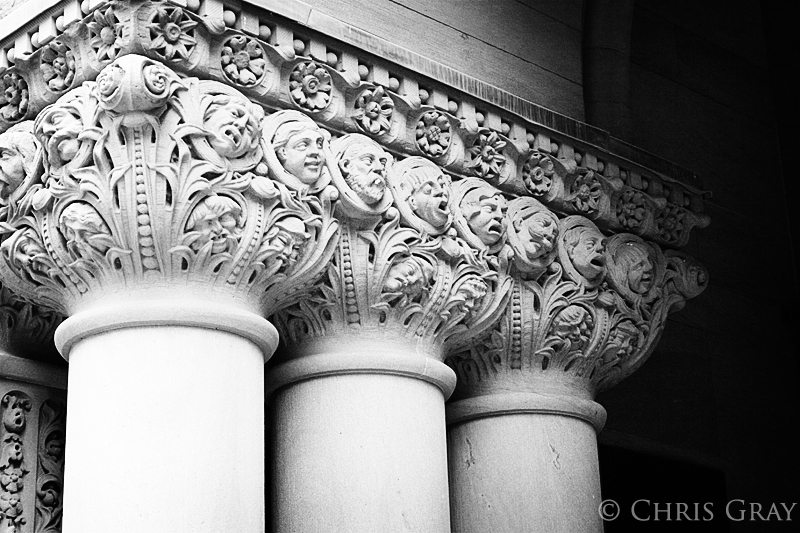 Detail of the entrance to Old City Hall. I have to say that some of these faces don't look too happy at all. Why doesn't architecture these days include details like this? Is it only because of costs? I like these details - they make the building more interesting, and they project a character onto it. 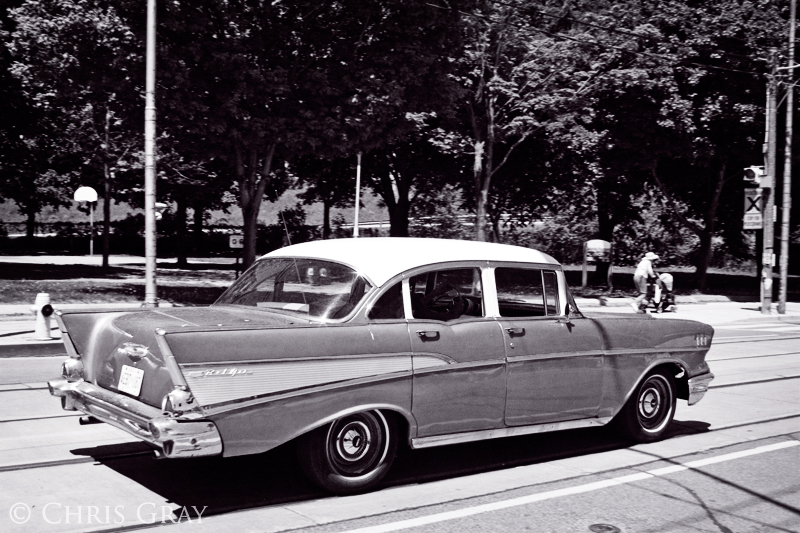 Another vintage auto - this time on King Street. They're all coming out of the woodwork, now that the warm, drier weather is here. Okay - maybe it's not a zombie. Maybe it's just got four flat tires, and has been chained to a bike post outside of the Urbane Cyclist for a week or so. But maybe it's being kept there to guard the bike shop from marauding car drivers.